Who has the toughest College Football schedule in 2011? College Football season is upon us. It’s about time! I wondered, who has the toughest schedule going into the season, and what conference has lined up the toughest opponents? A tough out-of-conference schedule can mean boom or bust for college football teams. With only a 12 -game season, it’s tough to make up for an early loss, even against a top team. Indeed, the risk-reward balance is out-of-whack when the system rewards preservation of a perfect record over any 1-loss team despite their schedule. 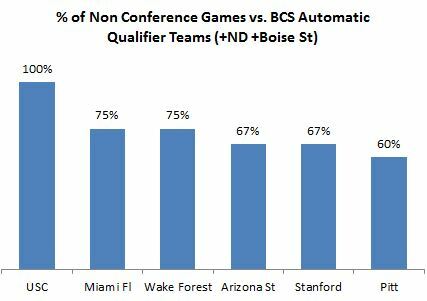 Methodology: I looked at each of the 6 BCS automatic-qualifying (AQ) conferences and looked at their non-conference games. I calculated the % of games played against the top 6 conferences, plus Notre Dame and Boise State. The ACC has lined up a pretty tough schedule. 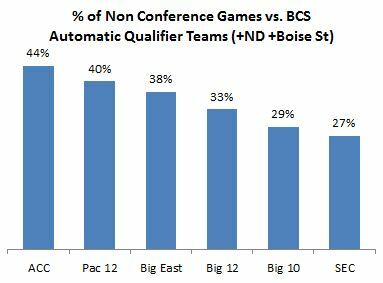 44% of non-conference games are against other BCS AQ schools. In fact, 8 of the 12 teams play >=2 games against AQ teams, and only Virginia Tech lined up a schedule of cupcakes (0 AQs). My hypothesis is that this does not bode well for the ACC when it comes to top 25 rankings, and that we’ll see the conference under-represented come the end of the year. The Pac 12, Big East, and Big 12 are in the middle – 40% – 33% of non-conference games against AQ schools. The Pac 12 and Big 12 only have 3 non-conference games, so it’s a tall ask to schedule more than 1 AQ game. The Big 10 and SEC are at the bottom. Both have 4 non-conference games, and average only 1 AQ opponent each. Only Ohio State, Iowa, Georgia, LSU, and Vanderbilt scheduled 2 AQ games. USC has lined up a killer schedule. Good luck Lane Kiffin. While they’re not facing the toughest of the AQ schools (Minnesota, Syracuse, and Notre Dame), any time you go up against another BCS AQ team, you’re in for a challenge. They have nothing to lose though, being ineligible for a bowl game due to sanctions. Similarly, Miami may have picked the right year to load up their non-conference schedule, as it faces looming NCAA sanctions as well. My hypothesis is that none of these teams will be contending for a BCS bowl when all things are said and done. Two of them will be ineligible anyway. Who are the teams that lined up cupcakes? Arizona, Mississippi State, Ole Miss, Texas Tech, Virginia Tech. and Washington State are the only schools that scheduled an entirely non-AQ non-conference schedule. What a joke.